Formerly the Church of St. John of the Hospitalers. The four walls of this rectangular building date to the 13th century. Originally fortress-like Crusader compound with its own chapel, it is still an imposing structure, especially viewed from the seaside. 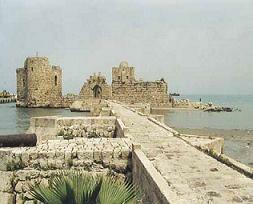 Sidon is a small and beautiful town on the shore of the Mediterranean Sea. It is located at the meeting point of three continents and, as such, has been the crossroads of many civilizations whose traces may still be seen today.